◦ Speaker type: bone conduction transducers. - Titanium wraparound headband is lightweight and flexible for durability and portability. - Wireless Bluetooth 4.1 connectivity and convenient multipoint pairing. 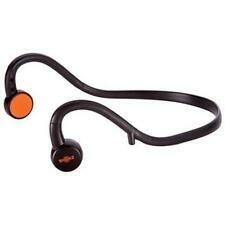 Aftershokz, AS600 OB Bundle. Titanium wraparound headband is lightweight and flexible for durability. OpenFit™ design ensures maximum situational awareness and comfort. We are sure that we can provide a solution that makes you happy. The lightweight and comfortable Trekz Titanium wireless stereo headphones are the safest alternative to traditional sport headphones and earbuds. Designed with athletes in mind, Trekz Titanium are sweatproof, secure, and will allow you to hear your surroundings - no matter where life takes you. New is Original box, never used nor opened. The box's plastic cover have a small tear. 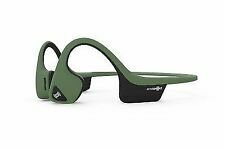 Aftershokz Bluez 2S Wireless Bluetooth Headphones METALLIC GREEN AS500SM. Very good pre-owned condition. I’ve rarely used them, maybe 4-5 times I purchased in 2016 for $99.95 includes the headphones and charging cord, —-NO box, NO instructions, NO charging plug. Photos show exactly what you will be receiving. Condition is Used. Shipped with USPS Priority Mail. Manufacturer AfterShokz. Host Interface Mini-phone. Cable Length 4.27 ft. Earpiece Type Binaural. Width 4.3". Height 7.5". Form Factor Open. Color Gray. AS600GRN Trekz Titanium Wireless Bone-Conduction Headphones. Lightweight and comfortable, Trekz titanium open-ear wireless bone-conduction headphones are the smart alternative to traditional in-ear sport headphones and earbuds because they let you keep your ears open so you can hear surrounding sounds. Dual noise canceling microphones exclude surrounding noise, effectively enhancing speech. LeakSlayer technology significantly reduces natural sound leakage. Wireless Bluetooth 4.1 connectivity and convenient multipoint pairing. 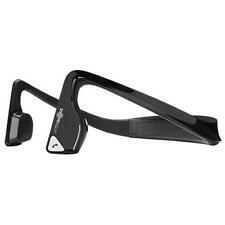 aftershokz trekz titanium. Condition is New. Shipped with USPS Priority Mail. 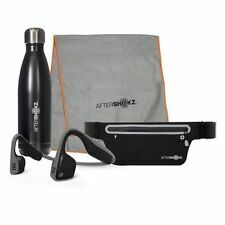 AFTERSHOKZ TREKZ TITANIUM Bundle Wireless/ Bonus Fitness Gear "NEW"
Aftershokz Trekz Titanium Bundle. Bonus Fitness Gear - Water Bottle Sport Belt Sweat Towel. Premium Pitch / Stereo Sound. 6 Hour Battery. 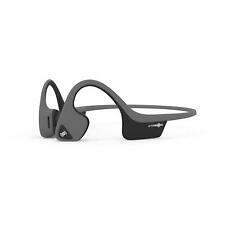 Aftershokz Sportz Titanium Bone Conduction Headphones. We’ve raised the bar for wired sport headphones. Introducing Sportz Titanium, the next generation of AfterShokz; more comfort and better sound quality at an affordable price. DESIGNED FOR LONG WEAR - Trekz Titanium Mini wraparound headbands are lightweight and flexible to ensure comfort during extended wear. With PremiumPitch Plus technology’s wide dynamic range and rich bass, and LeakSlayer technology to reduce natural sound leakage, you are ensured the best on-the-go audio. READ DESC.--Aftershokz AS500 Bluez 2 Open Ear Wireless Headphones--READ DESC. Aftershokz AS500 Bluez 2 Open Ear Wireless Stereo Headphones - Repaired Headband. Very cool model headphones. If you are tired of wearing in ear or over ear headphones you will love this set. I got this set with two spots on the headband that had cracked. 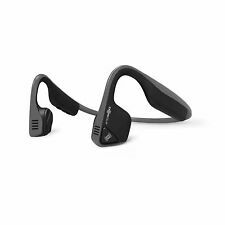 4.5 out of 5 stars - READ DESC.--Aftershokz AS500 Bluez 2 Open Ear Wireless Headphones--READ DESC. 8 product ratings8 product ratings - READ DESC.--Aftershokz AS500 Bluez 2 Open Ear Wireless Headphones--READ DESC. Speaker type: bone conduction transducers. Titanium headband is lightweight and flexible for durability and portability. Cube : 64.96". Height : 6.10". Width : 2.29". Length : 4.65". Weight: 1.48 oz (36g). New Unopened Running Headphones, Wireless Bluetooth, AfterShokz Trekz Titanium. Listen to your tunes anywhere with these AfterShokz wireless headphones. You do not have to be tethered to your phone or other music device when you own a pair, which means you can go running or hiking with them. You can find new or pre-owned Aftershokz headphones on eBay. These headphones are unique in that they use bone conduction technology. This means that sound is sent to the inner ear through the bones of the skull, no eardrum necessary. The "ear" pieces fit directly in front of your ear, allowing your ear canal to remain unencumbered. Since the sound is going through your bones, you can sometimes feel a slight vibration. This is the clue that they are functioning as they should. A gaming model for these wireless headphones is also available. How is bone conduction technology useful? Since you are not plugging your ear canal with ear buds, you can hear what is happening around you. You do not have to become oblivious to the rest of the world when listening to your music or podcasts. For those who exercise outdoors, especially long-distance, this is extremely helpful in that you can listen to your music while exercising and still be safe. 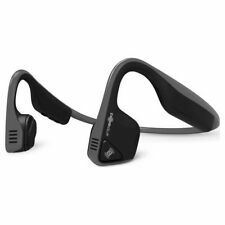 What are some other features of these AfterShokz headphones? Audrey Says: This is a voice prompt that allows you to speak commands for pairing and playing. Noise-cancelling microphones: These microphones enhance your speech to callers. LeakSlayer technology: This reduces leaked sound. PremiumPitch technology: This technology enhances your sound experience. 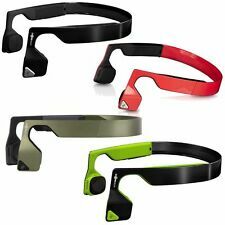 What are other specifications of these AfterShokz? Content provided for informational purposes only. eBay is not affiliated with or endorsed by AfterShokz.